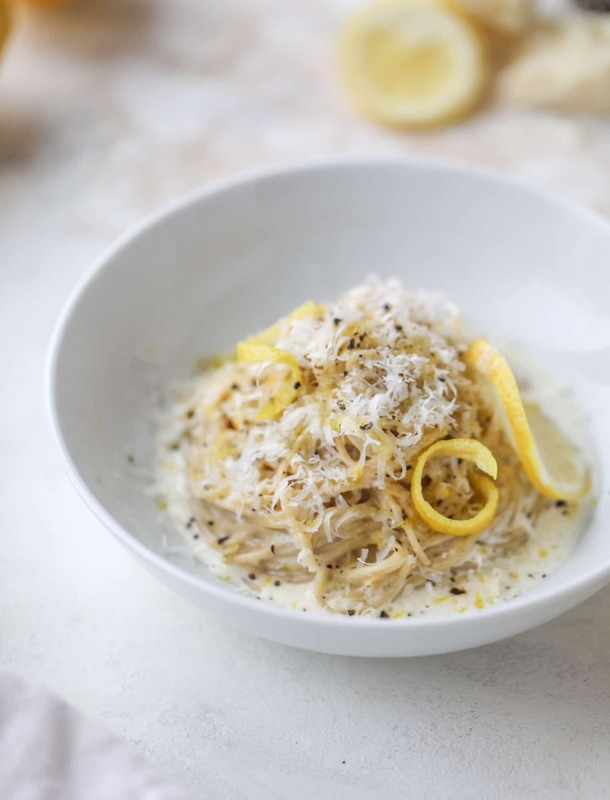 Monday calls for the coziest lemon pasta ever. It’s meatless, it’s refreshing, but it’s also cheesy and comforting. Perfect for curling up in a blanket after a long winter start to the week. Give me alllll the lemon! Like this little meyer lemon grated below. It’s so bright and fresh! I grew up a self-proclaimed pasta-hater (very strange, I know, doesn’t everyone love pasta?!) so it’s nuts that I’ve already shared a few pasta dishes in 2019! Because of the lack of love, we don’t eat pasta very often. But that sheet pan gnocchi and this lemon pasta? Ooooh. I could probably make them weekly. We enjoy them so much! Okay, I use the term “we” loosely. Okay! More for me. I mean us. You and me! This recipe serves two or, I mean, I guess one if you’re having a wonderfully obnoxious Monday evening. It’s the perfect thing to make when you want to feel a little fancy. I mean, a little fancier than cheese, crackers and wine for dinner while you get sucked into the Internet vortex of your ex-boyfriend’s sister’s cousin’s wife. Not that I have any idea what that is like. It’s super simple too. There are barely any ingredients. In fact, there are only six if we don’t count salt and pepper. I used whole wheat angel hair for a twist, but if I want to get indulgent, I’ll go with bucatini. You technically only need one lemon and cream. And lots of freshly grated pecorino. After that, you make a lovely sauce and toss the pasta while throwing generous handfuls of the cheese on top. Next, a big crackle of black pepper. Finally, a fork for twirling. And maybe a spoon for extra sauce. The lemon pasta is the perfect dish to serve with a big greens salad. Kale Caesar or my favorite house salad? Those would be number one. It’s such a fun, easy and elegant meal! 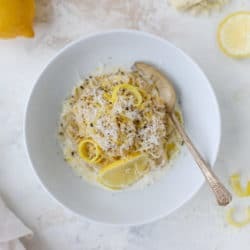 This cozy lemon pasta is light, refreshing and perfect for dinner when paired with a simple greens salad. It comes together in 20 minutes! Cook the angel hair (or pasta of your choice!) according to the directions. Make sure to boil it in salted water! You want to reserve about 1 ½ cups of the starchy pasta water once it’s finished cooking. Zest the lemon rind and juice the lemon into a bowl. Place the lemon zest and heavy cream in a skillet or pot and heat over medium heat. Whisk the mixture often and bring it to a simmer – this will only take 1 or 2 minutes. Turn the heat down to low and whisk in the butter 1 tablespoon at a time. You want the sauce to be creamy and slightly thickened. Increase the heat to medium-low and whisk in ¾ cup of the pasta water and lemon juice. Place the pasta into the cream sauce and toss it well, using kitchen tongs to turn it over and coat the strands. Add the pecorino and continue to toss. If the sauce isn’t creamy enough, add in more of the pasta water a few tablespoons at a time until it’s reaches the desired consistency. Sprinkle on lots of freshly cracked black pepper and extra cheese. If desired, you can garnish with some fresh chopped parsley or lemon twists! And a little extra cheese. Of course. I looooove lemons, but I’ve always been hesitant to add it to a savory pasta dish. No more hesitating! Looks delicious! I can’t wait to try this recipe. Quick question, does the ” 4 Tablespoons” refer to butter? yes butter! thank you christine! I basically made this the other day for dinner, but since I was home alone (and had no cream), I made it as a one pot pasta. I just couldn’t stand the thought of going to the store for cream or washing more than one pan. But now I want the creamy version! 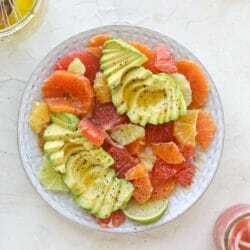 maybe try this one with half the zest! Btw, I made your apple cinnamon oatmeal latte today (only 1 espresso shot though since I’m pregnant) and it was SO good! Holly, you can use fresh grated parmesan cheese. It is easy to find. and so glad you loved the latte. :) congrats too! This was very good. I made my sauce thicker and added tarragon with the cheese. So glad you enjoyed it tasha! This looks absolutely amazing! Can’t wait to try it out. This is freaking delicious! I have tried 10,000 lemon pastas and this my friend blows them all away! I never leave comments any where about anything but I had to, unfreaking believably great. eating it as i type… DELICIOUS! I did throw in some arugula to cancel out the butter/cheese/cream. Super healthy, right? Thanks for another great recipe! So delicious, thank you! Served it with roasted broccoli and asparagus. OMG made this last night and it was so freakin’ delicious! My husband is the opposition of Eddie – the more lemon the better. Recipe calls for one lemon, better make it two. This is a keeper! !